In February, my Mom came to visit me in Seattle. During her visit, we spent two days working on a sewing project -- making bike skirts. As I don't have any experience with sewing, my Mom taught me how to modify an existing pattern, how to lay out and cut the fabric pieces, how to sew the pieces together, and then how to add the finishing touches so that the skirt looks like the real deal. My mom, slaving away at the sewing machine. We made the skirt in two colors: gray and green. We used quick-drying, rip-stop fabric. We created an adjustable waistband, so that the skirt would still fit after a few months on the road. 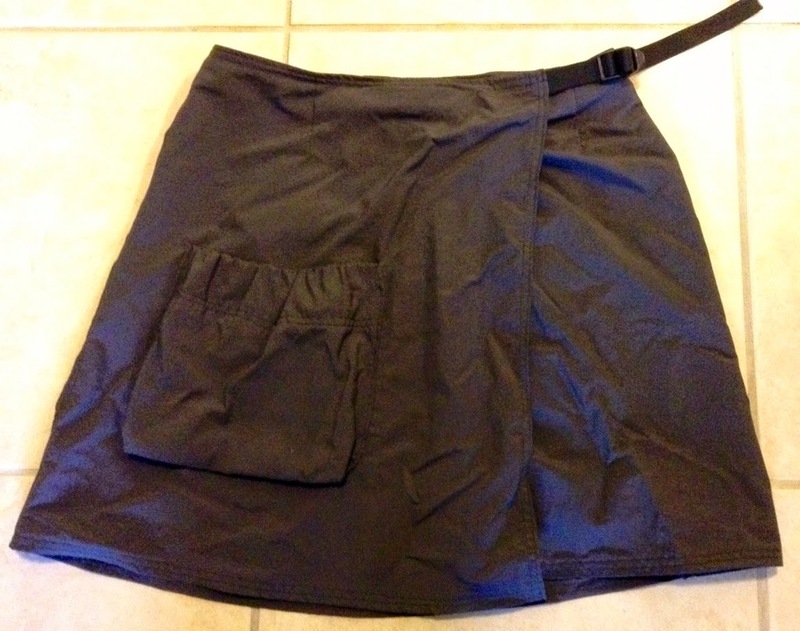 We added a nice, big pocket in the front of the skirt, to hold things such as chapstick and snacks. And we sewed a hidden, waterproof pocket in the waistband for valuables, such as a passport and cash. Ain't it grand? So far, I've received lots of compliments! 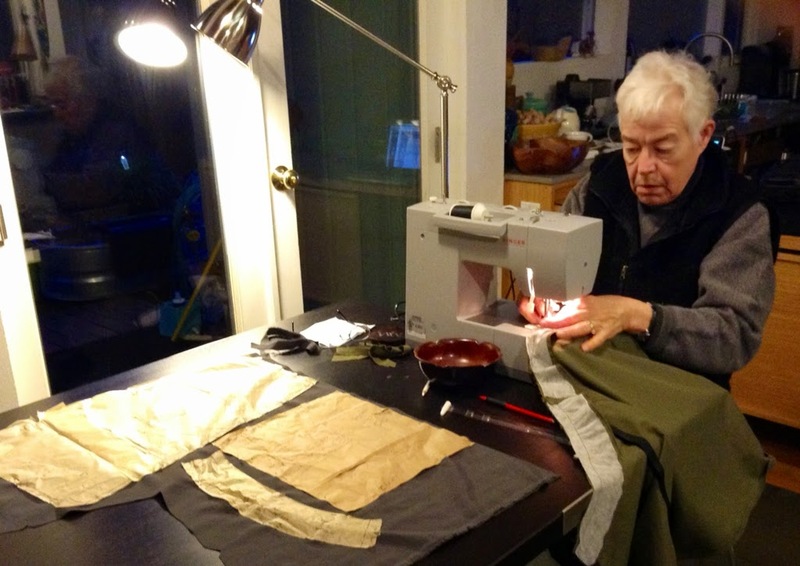 If my mom were looking for a full-time gig, she'd definitely find one in designing and sewing bike skirts. I love my skirt. It's already come in handy many times on this trip. Somedays, I'll wear the bike skirt over my bike shorts. 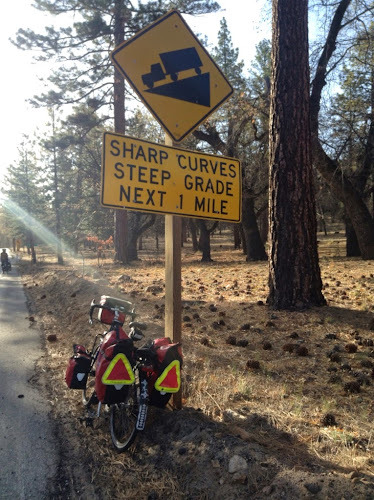 Other days, when my bum is looking for a change from my chamois padding, I'll wear the bike skirt by itself. I'll tell ya' something, the skirt has definitely come in super-duper handy at providing a degree of modesty for my roadside pop-a-squats. Thanks for the skirts, Mom! A drawing of my waist to my feet. It was below freezing when we awoke this morning. 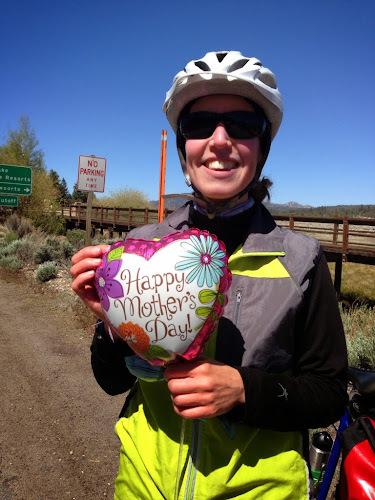 The ride started out with a few miles of flats, followed by a one mile-long descent. Immediately after that, we began a slow, but steady, 2,000 ft ascent. Although it was cold out, we didn't feel the need to wear too many layers, as we'd stay warm while climbing. 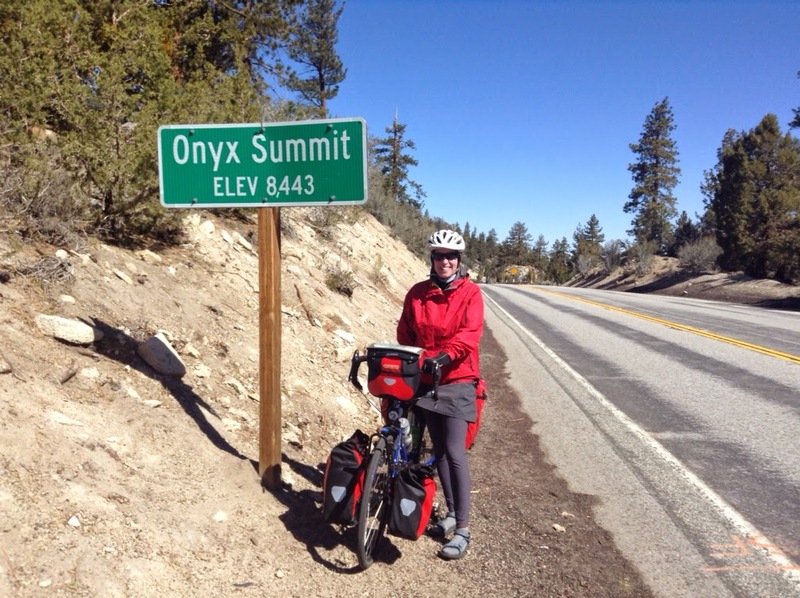 At the end of the climb, we arrived at our highest summit thus far -- Onyx Summit, at 8,443 ft. It was freezing at the top of the summit, and the winds were about 30 miles an hour. In preparation for the descent, we donned lots of layers. Although I put on my ear warmers, I wish I had put on my balaclava. And although I'm glad I had my sunglasses to protect my eyes from the bitter cold wind, I was thinking that a pair of ski goggles might have come in handy. Although today's descent from Onyx Summit was definitely the coldest decent yet, we're fortunate that the winds weren't as strong as they were on our decent from the other day. That would have made for an uncomfortably dangerous ride. After our descent, we rolled into the towns of Bear Lake City and Big Bear Lake. These are popular tourist towns for Southern Californians. We stopped at a fun carving shop on the side of the road. I thought this mountain man was pretty cute. The carved mountain hottie and me. Sneaking a squeeze of the mountain creature's cute toosh. In hopes that one more shortish day of riding will help to heal Alex's saddle sores, we're staying in another motel tonight. 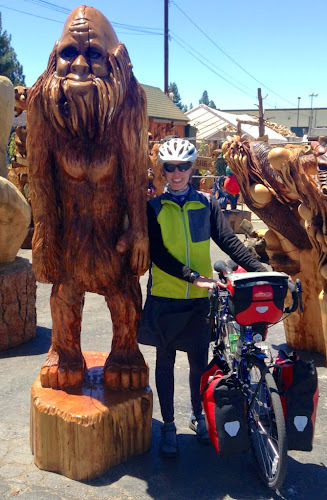 For those of you who know me well, you know that I'm not a fan of motel stays on bike tours. But, it's more important to me that my riding buddy enjoy the ride. And if that means a few creature comforts, I'll gladly sleep in a bed tonight. Alex, I hope your rear end heals quickly! Mom, rest your riding spirit. Cuz we've got some more hills tomorrow! The skirts look nice... Maybe you should start a bike skirt business with your Mom. Thanks! Now there's a possibility!